Don't cry because National Ice Cream Month just ended. Grab your chocolate, marshmallows and graham crackers and get ready for National S'mores Day on Saturday,. August 10, 2019. If you and your kids love to make s'mores — and who doesn't? — then you'll want to include the gooey treat in your weekend getaway plans. While you can certainly make s'mores over any campfire (or even in the microwave, in a pinch), some resorts elevate s'more-making to a yummy art form by providing firepits, ingredients, skewers and a beautiful setting under the stars. These family-friendly resorts will leave you wanting s'more. Fresh from a redesign on the Outer Banks, the Sanderling Resort gives families plenty to do with its three pools, stand-up paddleboarding, kayaking, surfing, biking and more. The revamped property features two new firepits on the Atlantic, where families can put their s'mores kit welcome amenities to good use. For families looking for a mountain getaway that's luxurious yet completely family-friendly, Whiteface Lodge is a fabulous choice. The only all-suite property in the Adirondacks offers a winning array of family-friendly amenities, from the heated indoor-outdoor pool and trio of hot tubs to the games room, bowling alley, movie theater, old-fashioned ice cream parlor, tennis courts, nature trails and catch-and-release fishing pond. In the evenings, families are invited to make s'mores around the outdoor firepit. On National S'mores Day, guests receive homemade s'mores for dessert after dinner. Blessed with a spectacular location on a quieter stretch of Daytona Beach, the oh-so-plush Shores Resort delivers much for families to love, from family-friendly connecting rooms with balconies (request an ocean view) to the lovely beachfront deck with its swimming pool, cabanas, large hot tub and firepits where families can use their complimentary s'more-making kits. The historic Grand View Lodge Golf Resort and Spa, located along the beautiful shores of Gull Lake is a family favorite for its huge array of activities, from watersports to 45 holes of championship golf. In the evening, the place to be is at the firepit, where you'll find s'more fixin’s and grill sticks. At Disney World, families can gather ’round the campfire, make s’mores and sing songs at Chip ‘n Dale’s Campfire Sing-a-Long at Disney’s Fort Wilderness Resort & Campsite. Chip 'n' Dale join the nightly activities which are followed by a Disney movie in a theater under the stars. This popular resort on Maine's rugged coast offers a raft of kid-friendly activities, including golf, tennis, bowling, canoeing, kayaking and swimming in the harborside saltwater pool. 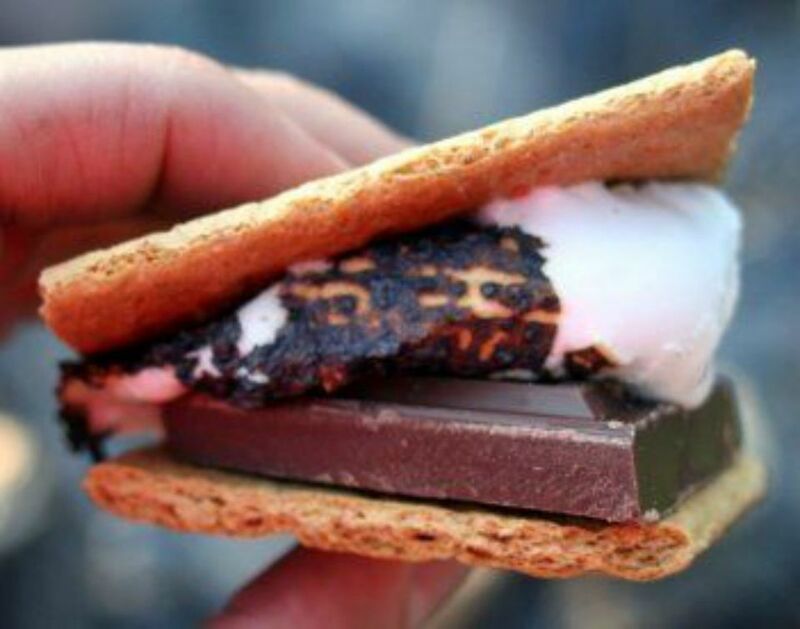 At night head down to the campfire singalong, where s'more roasting is always part of the fun. Tucked away in the St. Lucia Mountains on the Monterey Peninsula, the 500-acre Carmel Valley Ranch is a summer camp-inspired resort that offers families a farmstead experience complete with riding horses, collecting eggs from the hen house and bee keeping. There's also a Junior Olympic pool, splash zone, bocce courts; and a children’s activity center and playground. The ranch also features firepits and complimentary nightly s'mores, which taste all the sweeter after a full day's play. Reminiscent of summer camp, Hidden Pond is a secluded 60-acre resort in the vibrant seaside town of Kennebunkport, Maine. The resort features 16 two-bedroom cottages, 20 bungalow cottages, a Tree Spa (treatment rooms are literally eight feet off the ground, nestled among the birch trees), an on-site 800-square foot organic Farm, two pools (one for families, one adult only) and the farm-to-fork restaurant, Earth. After dinner, grab a basket stocked with classic s'mores ingredients and enjoy dessert by the bonfire. Unsurprisingly, s'mores are a popular treat in Chocolate Town, USA. One of three official Hersheypark properties, the sprawling Hershey Lodge is a mid-priced choice with two pools, tennis, basketball, mini golf and a full schedule of kid-friendly activities throughout the day. Each evening, families gather to make s’mores at a campfire alongside the hotel’s small lake. After a long day at the Universal Orlando parks, families can relax and refuel with a good old-fashioned s’more. Situated within walking distance of Cabana Bay’s two pool bars, the resort boasts four fire pits. S’more kits are available at the Bayliner Diner, or you can bring your own supplies. A luxurious private island resort in San Diego's Mission Bay, Paradise Point is surrounded by over a mile of beach with bonfire pits in the sand for roasting s’mores. Families can buy s'more kits at the Island Market and roast s’mores on the beach or at the firepits in the pool area. With its multiple pools, lazy river, and waterslides, JW Marriott San Antonio Hill Country Resort & Spa is unabashedly family-friendly by day. Then, starting at dusk, the resort offers even more fun for families with its nightly complimentary s'more-making around the firepit and poolside movies. After a full day of horseback riding, mountain biking, zip lining on one of New England's longest zip lines or hanging out by the pool, families can pick up a s'mores kit at the Omni Mount Washington Resort's Morsels and snuggle up by the outdoor fire pit to create scrumptious treats. Located between Santa Fe and Albuquerque, the Hyatt Regency Tamaya Resort & Spa offers three pools, championship golf, horseback riding, hiking and biking trails and Camp Hyatt for kids. Nghtly s'mores-making at the outdoor firepit can be combined with the resort's Native American storytelling activity. Devotees of s'more-making will enjoy the complimentary "marshmology" experience offered by the Ritz Carlton Lake Tahoe each evening at the hotel's fire pit. The hotel's marshmologist (no, really!) leads a discussion in the "Art of the S'more" and you can sample house-made marshmallows flavored with mint from the chef's garden. For a gourmet twist on the humble s'more, the Del is the place. You can cozy up to your own private beach bonfire, tuck your toes in the sand and enjoy the classic treat with traditional graham crackers, Hershey’s chocolate and jumbo marshmallows. Or you can go gourmet with Ghirardelli chocolate, fresh fruit, candy toppings, flavored marshmallows, bacon and more. High in the Allegheny Mountains, the Omni Homestead lets families enjoy s'mores during an evening hayride along the resort's private trails. Available daily from 5pm-6pm, from March through November, the tractor-driven hay wagon brings families to a destination campfire where they can make and enjoy s'mores among a roaring outdoor fire. With 400 acres of waterfront property, myriad kid-friendly activities and a wide array of accommodations for every budget, the Lake Raystown Resort is a popular choice for families in central Pennsylvania.On National S'mores Day, the resort will host Ultimate S’more-Eating and S'more-Building Competitions. The oh-so-luxurrious Resort at Paws Up offers high-end adventures for families—horseback riding, river rafting, fly fishing and more—and is famous for its glamping experience (personal tent butlers, anyone?) as well as its nightly s'more-making. Create a classic s'more or try the resort's take on this delicious outdoor treat: the S’mores Doughnut. Blessed with an unbeatable location on gorgeous Cannon Beach, the oceanfront Hallmark Resort & Spa offers spacious suites, two indoor saltwater pools, and spectacular views of Haystack Rock and Tillamook Lighthouse. Every Sunday evening during the summer months, families can gather at beach bonfires with s'more kits (including firewood and roasting sticks) and enjoy making the delicious desserts. The iconic Kona Kai Resort & Spa, located on the tip of San Diego's historic Shelter Island, features a private beach along with an incredible marina closest to the Pacific Ocean. Enjoy s'mores around firepits by the marina. Just past the Hamptons, on the tip of Long Island, the Montauk Yacht Club Resort & Marina offers nightly s'mores parties at their permanent fire pit. Families can bring their own ingredients or they can purchase a kit at the resort. The luxurious Montage Deer Valley holds a s’more hour every afternoon around the firepit, where families can choose from marshmallows in different flavors (cinnamon, peppermint, vanilla, caramel, and pumpkin spice) as well as the classic marshmallow. The resort’s famous hot cocoa is part of the experience.